The problem was that ours was cheap, not particularly well made, and the fabric boxes didn’t balance particularly well. It was fine when she was young because it was so light and small that I wasn’t too worried if she should accidentally tip it over. By the time she was over two it was annoying her sufficiently that she’d just dump the storage boxes on the floor and leave them there but ignore the storage shelves (it was also so light that she could move it or tip it over just ’cause). Note: It is now proving far more functional as a shoe rack. I wanted something a bit more sturdy and multi-functional that would serve her for several years (or longer). I had thoughts of getting a bookshelf. 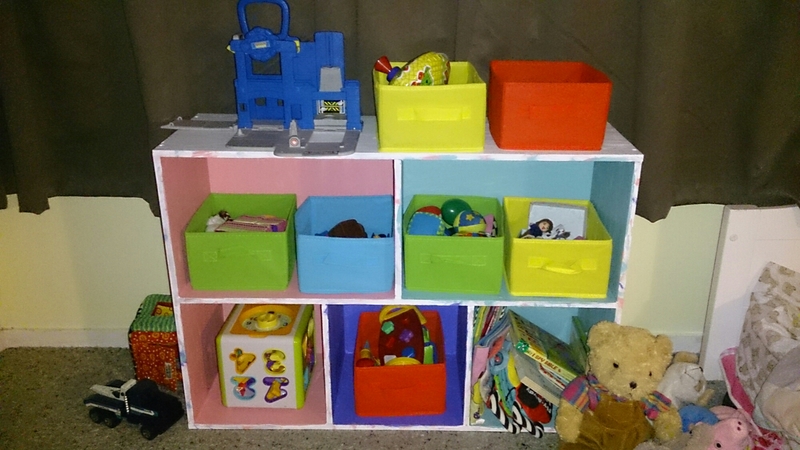 The constraints were that it needed to fit her existing toy boxes, needed to fit under her window (i.e. in the available space), it needed to be cheap, and I needed to be able to transport it in the boot of the hatchback. Those requirements required both aesthetic flexibility and patience. 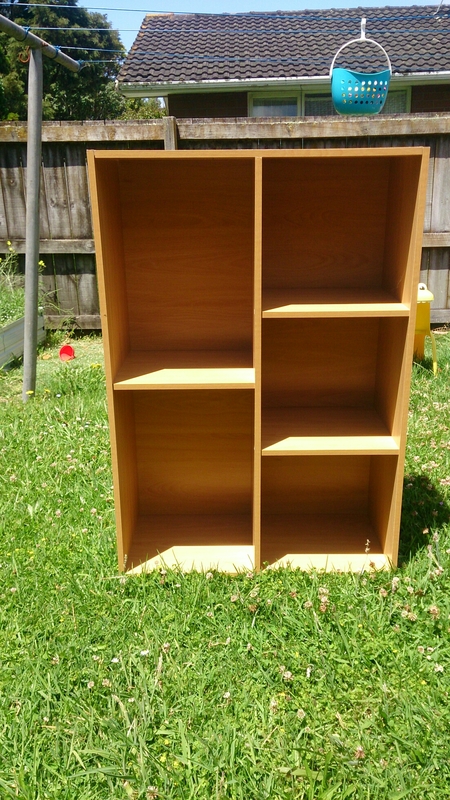 After a couple of months I found a cubbyhole-style bookshelf in a secondhand store for $10. It was too tall but this simply required a change of perspective (i.e. flipping it onto it’s long side). I also wanted something in her room that was a bit more colourful and personalised for a change (we rent so decorations are limited). We headed into Resene’s to discuss options for painting the bookself. Now, unfortunately, it’s MDF particleboard covered in a laminate veneer which means that the professional advice is basically not to paint it (because it will peel off) or spend a whole lot of money on base paint, coloured paint, smoother, and sealant. The white base paint (500ml) alone was going to be $30. It’s easy looking at beautiful pictures on PinInterest to assume that everyone is enormously successful on their first attempt; this is not one of those stories (or it sort of is but with a caveat). I decided to persevere (really, peeling paint! ?, a sales tactic surely!) and spent a grand total of $9 on testpots. This was achievable only because I take advantage of free testpot offers whenever I can, had 2-4-1 vouchers to use, and had a half testpot of purple paint at home. It also would have benefited from a third testpot of white paint but c’est la vie. I put a plastic playmat outside on the grass and took advantage of a sunny afternoon ( a Dora the Explorer DVD also ended up being a necessary tool after the first hour). I did a white base coat, using Half Alabaster White, over the entire bookcase (apart from the back) and flipped it once I thought the first long edge was dry. 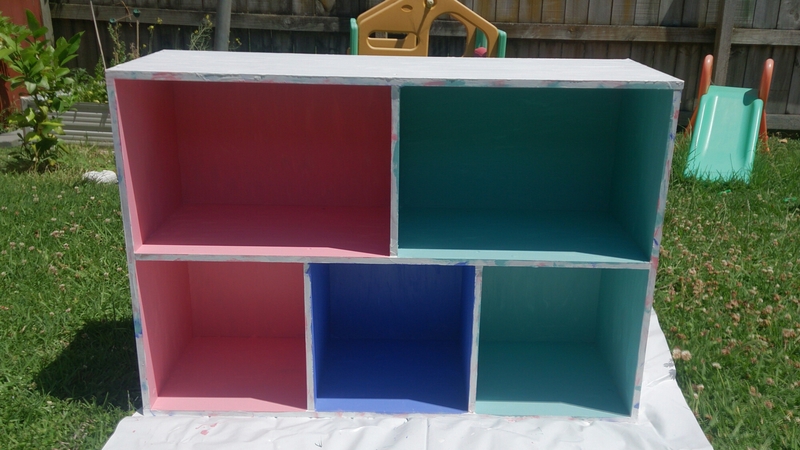 I then did a single coat of coloured paint in each of the cubbyholes. I used Suzy Q (pink), Hope (blue-green), and Gypsy Queen (purple); I note that Suzy Q and Hope are from the same colour palette and there was a lovely light purple that would have matched better but I already had leftover Gypsy Queen from another project. Once it was dry I added more coloured paint to achieve a good colour consistency but kept a small amount of each colour back in reserve in case touch ups were needed in the future. I also eyed up the white edgings trying to decide if I wanted to get those all perfectly white. I decided that I quite liked the organic look of the colours bleeding towards each other and did it deliberately while painting (and added to it afterwards). After it had a nice long dry in the sun I lifted the bookcase only to have big strips of white paint peel away and partially stick to the plastic mat. Turns out that plastic laminate is problematic after all. I had to peel more paint off that side in order to tidy it up; on the bright side it also peeled off the mat easily and was easy to ball up and bin. I carried the bookcase inside onto lino and carefully repainted the ‘bottom’ side. 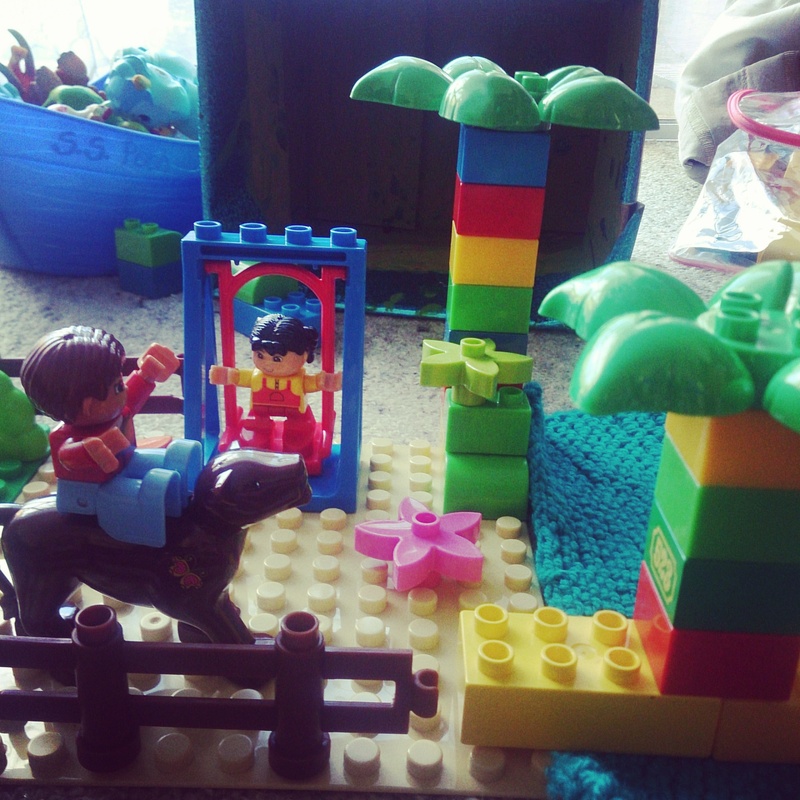 My 2 two year old loves playing with Duplo and is fortunate that her grandparents stored a bucket of it all these years (decades really) in the hope that she would one day exist. Adding to that Duplo / Big Blocks has been my challenge. I realized that what she really needed was some kind of base plate to fix the blocks onto and I also wanted some additional pieces that would support imaginative play (and keep me amused as well as she cried ‘Mummy! Come!’ and I find myself pulled along to be her playmate. Duplo, I discovered, is expensive. It also seems to get sold in big themed sets and even at Christmas it doesn’t really go down in price; also in the big sets often the majority of pieces are just blocks which you might not actually need. I turned instead to AliExpress. It’s possible to order big themed sets from them but you can also buy individual pieces – like deciding that you want x6 flowers and x3 tree-tops. It’s great way to spruce up your existing blocks and you can often get free international shipping. 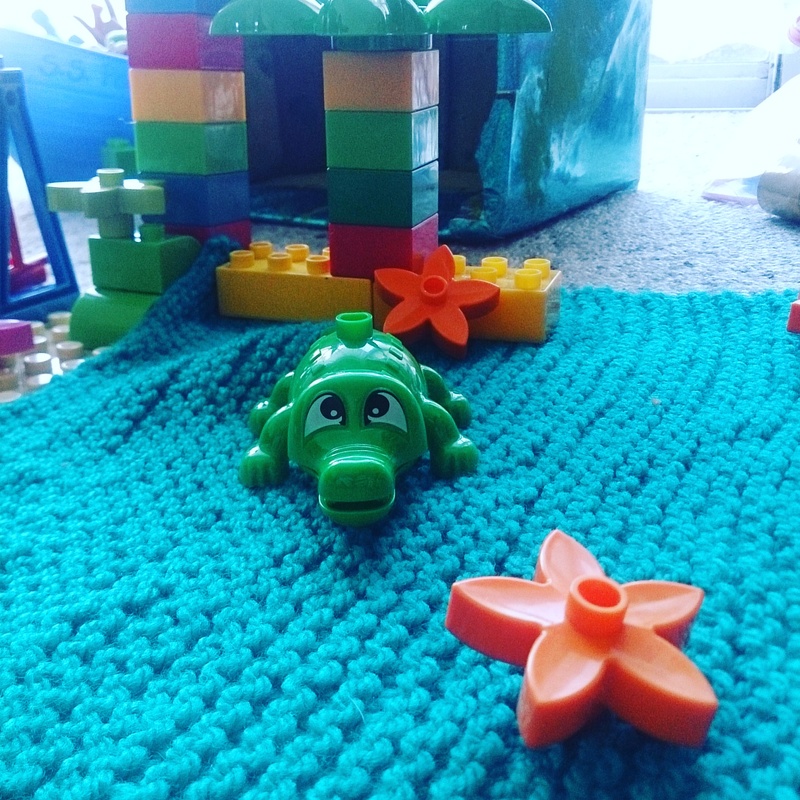 It pays to check carefully – there’s a vast size difference between Lego and Duplo so make sure that you’re searching for Duplo / Big Blocks and message the seller if you’re in doubt. 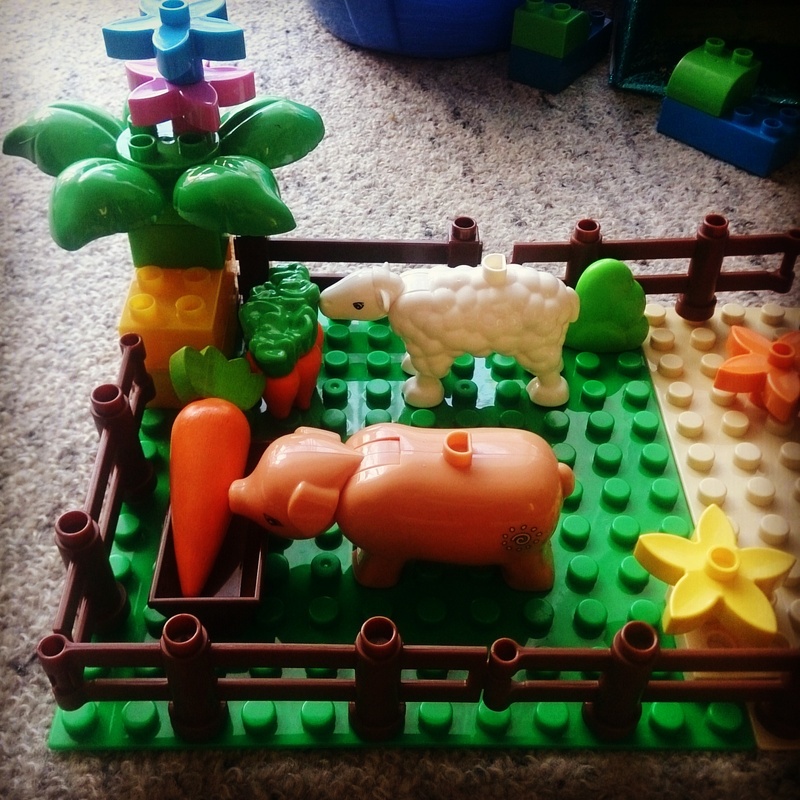 It can also work out cheaper to get mini sets, depending on what you’re looking for, like getting a large pig (with moving head) + feed trough + two flowers + two blocks for USD$3.60 (and free shipping). Individual sellers will often have items on sale and there are big sales through the year so you can always put stuff on a Watchlist if you want to wait for prices to come down even further. Admittedly, it’s luck of the draw exactly which dolls you get (though you can try messaging the seller to see if they’ll take requests). We got, so my daughter informs me: Mummy Doll, Daddy Doll, Big Sister, Baby. It worked out much cheaper (and more convenient) than going to the shops. I was thrilled that this particular purchase arrived within two weeks; realistically, you need to act on the assumption that anything ordered from AliExpress will take four weeks. 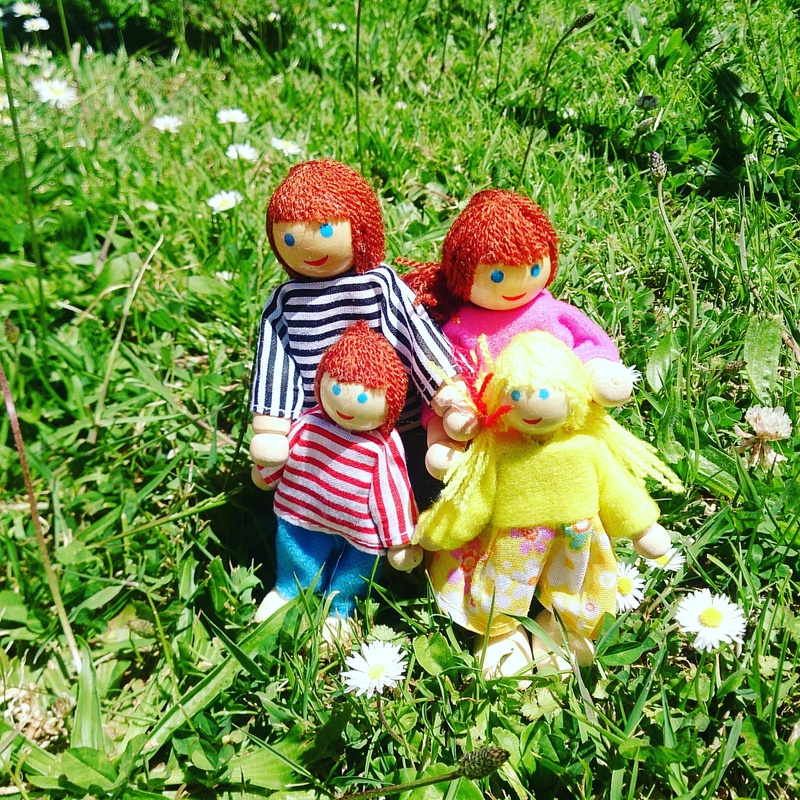 If you want to pick up something more quickly, I hear that Kmart now sell a family of five wooden dolls for NZ$10 (sadly they still don’t have a website showing their products online). There are also options such as Hape which sell a family of six (you can choose Caucasian, African American, or Asian) but they do cost rather more.